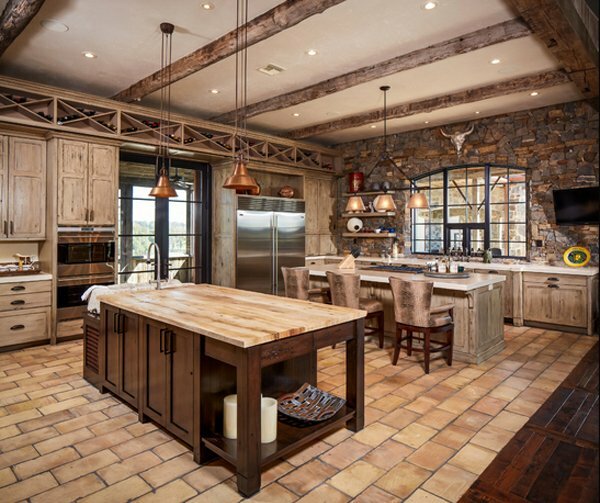 Before, when we hear rustic, we hear worn, distressed and rough-hewn; but today rustic kitchens rival the classic white kitchen in popularity, thanks to their timber, stone, brick, vintage appliances and fireplaces. Rustic designs may be next to vintage for the most loved styles every generation have seen and pretty much enjoyed. 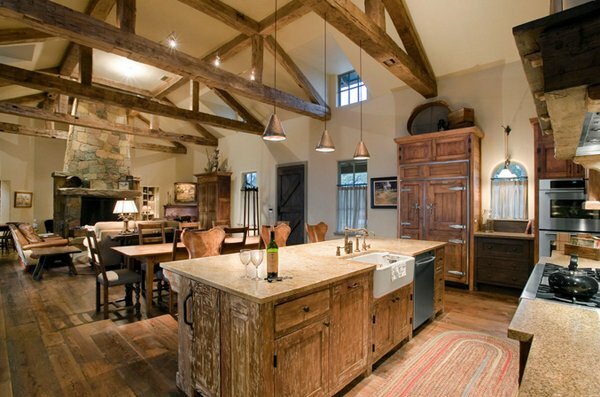 We all know that reclaimed lumber and barn wood add warmth and history to any space it is decorated in. 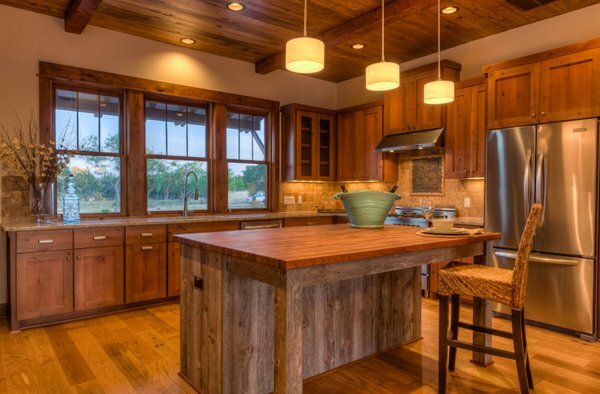 Some Texan homes we see in magazines and in the internet embrace this warm and weathered look, with old barn wood lining cabinets, walls, as well as floorings. Luckily for us, pieces made from reclaimed lumber are no longer hard to come by, no wonder designers and furniture makers love to work with this material. 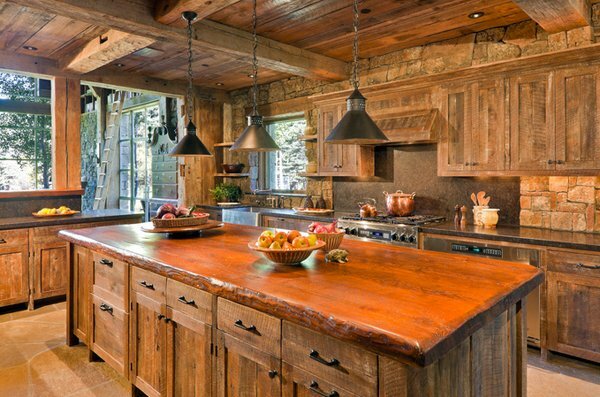 So, without further ado, let us check out the 15 Interesting Rustic Kitchen Designs below. Island with Teak end grain Chopping block, aged Zinc range surround and reclaimed Indonesian teak eating surface. Pantry rollout is nested over stair steps and the back Hutch with sink, and work surface and display above all nested and integrated. Every inch used and exploited. Designed as a prominent display of Architecture, Elk Ridge Lodge stands firmly upon a ridge high atop the Spanish Peaks Club in Big Sky, Montana. Designed around a number of principles; sense of presence, quality of detail, and durability, the monumental home serves as a Montana Legacy home for the family. Reclaimed wood floors and distressed cabinets add a rustic touch to this gathering room. 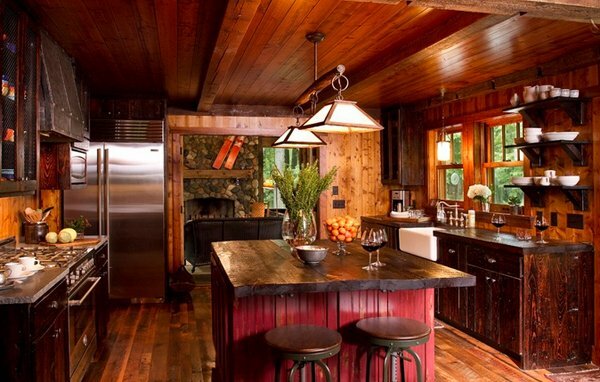 The color of this rustic kitchen is fascinating and really lovely. The thought of having reclaimed packing crates for the flooring is beyond words. 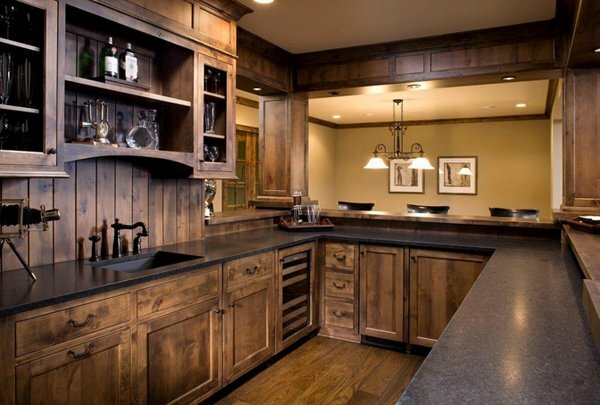 Consider reclaimed wood for your countertops. A couple of coats of PUR will keep wood countertops protected from spills and rotting. If you’re renovating an older home, look in the attic for beautiful old floorboards to use for countertops. 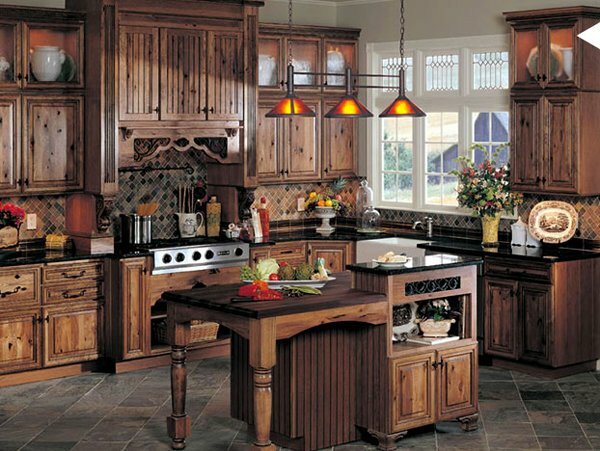 If you’re afraid a rustic kitchen will be too dark, forgo upper cabinets for windows to let in the light. The cabinets are nice, but a bit too warm. Honestly, we love tons of storage but we can’t seem to find what the homeowner keeps in all these cabinets. 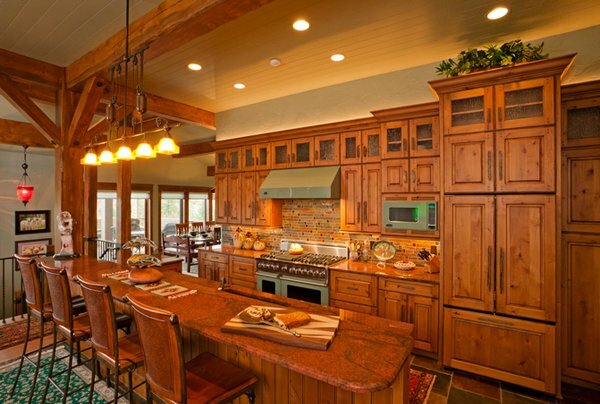 Tons of wood were used for this kitchen; we can see that some are stained and others were kept in their natural state. 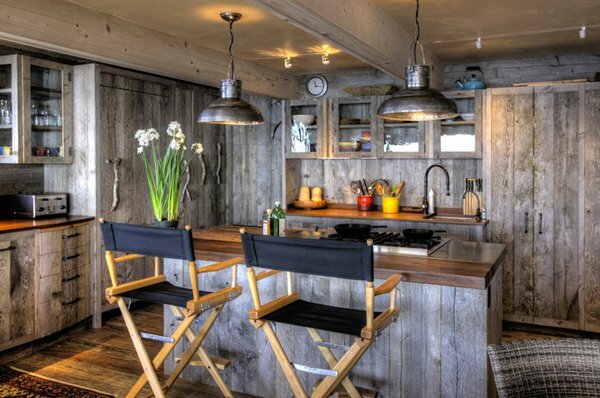 Even the corrugated metal as backsplash complements well with all the appliances in this space. We can see a highlighted kitchen island with wood top. If only the drawers face the other side, we could actually add chairs for a nook, but of course, we can assume that they have a great dining space. We love the dark color which completes this kitchen space – from the cabinets to the flooring; even the dark countertop makes the space prettier. Mullet Cabinet created a warm kitchen in bold hues of red, but it’s the tile work, wood-burning oven and natural wood accents that make this space so eye-catching. 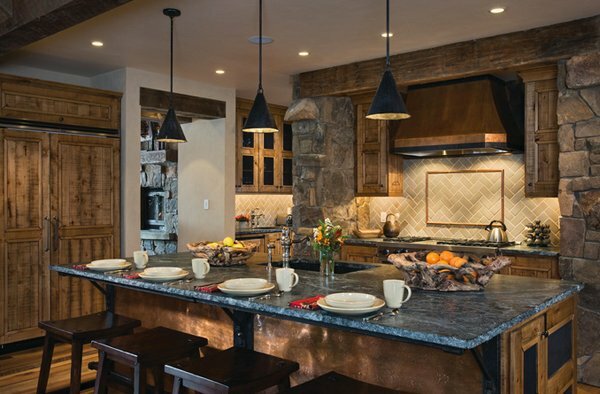 Home on the Range Inc.
A handcrafted rusted metal stove hood was suspended from iron bars and timber framework in this western homestead ranch kitchen. 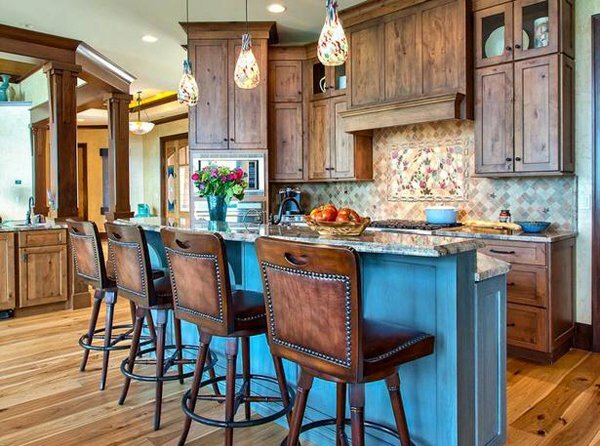 Handmade colorful pendant lighting accent the kitchen island area, while high-back barstools upholstered with leather add to the rustic feel of the kitchen. 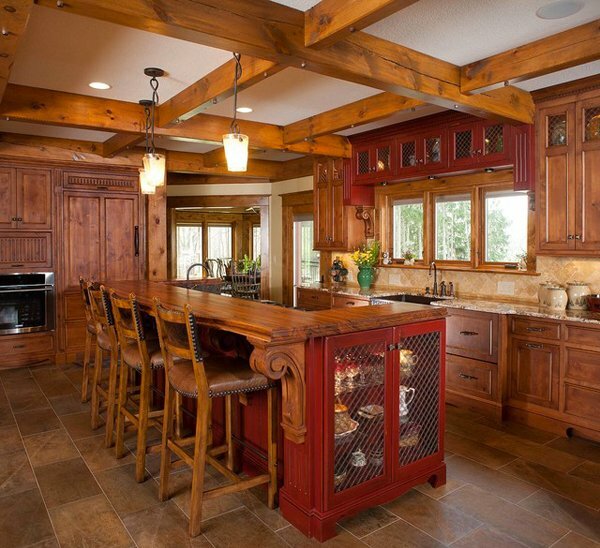 A heavy timber work done in this kitchen is really compelling but really interesting. It seems like you are living in a log house of some sort. The original cabinets are freshened up with a deeper, richer stain and small mosaic tiles installed as a contrasting backsplash. 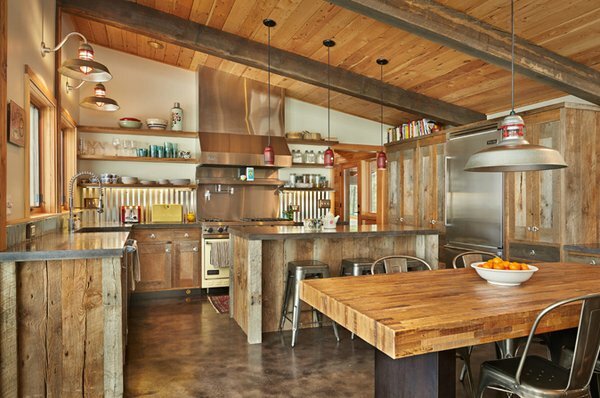 Steel appliances and countertops infuse the space with an urban rustic vibe. A combination of distressed cabinets, curly maple counters, a worn farmhouse table, a metal candle chandelier and a soapstone sink completes the look of a rustic kitchen. 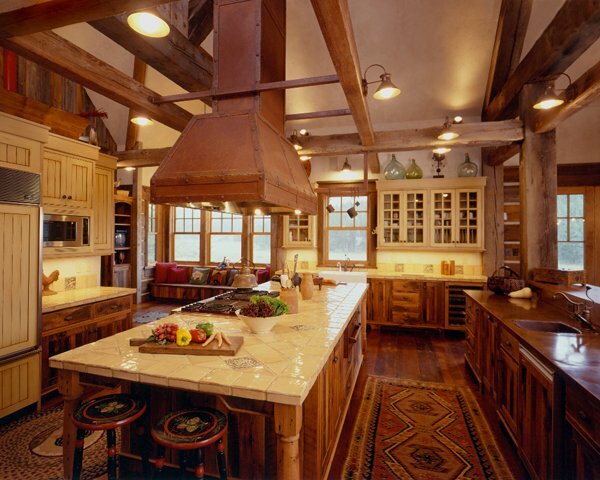 You can combine your light-colored-kitchen dreams with rustic elements like reclaimed wood on the island or countertops, exposed ceiling beams and a hardwood floors just like the 15 Interesting Rustic Kitchen Designs. 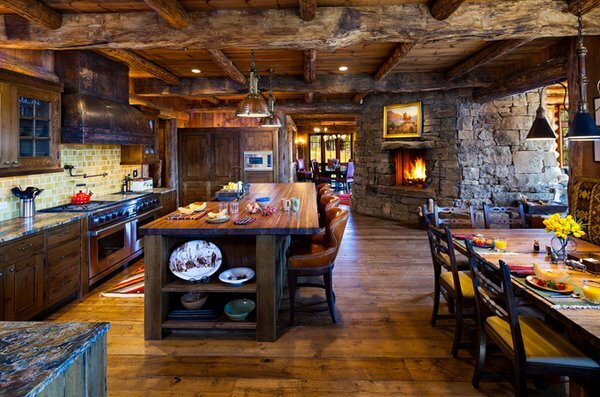 We also have a list of rustic living room designs for more rustic inspiration.